We would be grateful if you could display our action alert posters on notice boards and at music venues, youth clubs, animal welfare stands, veterinary surgery waiting areas, etc. Thank you. Holidaymakers - Make your holiday cruelty-free! Please view our range of posters. Stop the Terror. Ban Hare Coursing. Poster highlighting the removal of around 10,000 hares from the wild every year by coursing clubs. The hares are forced to run for their lives in front of muzzled greyhounds. An image shows a hare sitting in grass. Which animal in the red coat gets your vote? 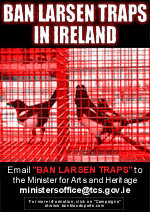 Poster encouraging people to write to their local TDs to demand an end to foxhunting in Ireland. An image shows a foxhunter holding up a dead fox. This Halloween weekend the horror continues. Only with your help can we stop it. Hares and rabbits have an important place in Ireland's biodiversity. Learn all about these fascinating mammals in a fact sheet by Mike Rendle of the Irish Hare Initiative.